The idea of a mobile home predates the invention of the automobile by centuries. In fact, you can trace it back to the age when oxen and horses were moving carriages. As soon as cars got enough horsepower from their engines, mobile homes were back. They evolved into RVs, the so-called recreational vehicles of today. In most cases, people associate RVs with low-income families who live in these decades-old mobile homes, or with neo-hippies who love traveling with a little twist of irony, but this is just one part of the RV universe. Modern RVs can get extremely outrageous, be it for the price, the looks or the attitude. These RVs can sometimes be so well-equipped, they seem like they could survive the apocalypse. Others are so absurdly luxurious, they stray away from the original idea of an RV. Whatever the case, these machines possess a special niche in the automotive world. Here’s a peek into the crazy world of top-tier recreational vehicles. 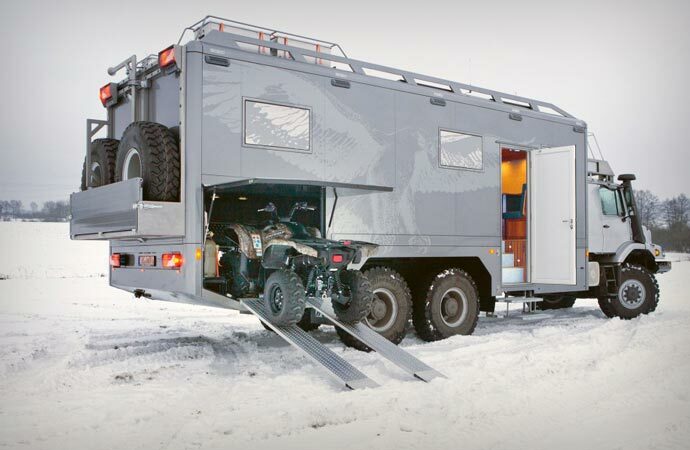 Keep reading to learn about the 10 most outrageous RVs out there. The countdown must start with the Winnebago, a company synonymous with the RV industry. During the RV heyday in the 60’s and the 70’s, Winnebago was the most recognizable player in the game, but in recent years as the demand for RVs dropped, the company has been struggling to get back its mojo. Luckily for all RV enthusiasts, the iconic flying W logo is back in form of the all new Winnebago Brave. The newest Winnebago RV will instantly make you fall in love with its retro styling reminiscing the original RV icons the company is famous for. The interior of the Winnebago Brave is also tastefully retro, but it offers all the modern amenities with a dash of nostalgia. Three different floor plans are available, making the Winnebago Brave an RV for virtually any family. The Brave is powered by a 362 horsepower 6.8L 3-valve Triton V10 SEFI engine mated to a Ford F54 chassis. The starting price of the new icon of American traveling homes is $97,896. While it’s a high price compared to the prices of second hand RVs, the Winnebago Brave is still a reasonably priced RV, at least until you start customizing it. The company offers endless customization options, and that’s where the fun begins.